My first flat tire; I had everything but a tire lever and the experience to change it. When I first met my husband, Tim, we got into mountain biking and while I loved it I was always a cautious biker for fear that I might pop a tire in the middle of the woods and my daredevil husband would be so far in front of me that I would be left alone helpless. I had all the necessary tools for changing a flat tire during our mountain biking days but I’m proud to say that during three seasons of the sport I never once got a flat. I watched Tim change countless tires and was always confident that if my day came I would be good to go. Last year when I decided to try triathlons (also at the nudging of Tim and others) I transferred my saddlebag from the mountain bike to my Cannondale road bike and added the requisite spare tubes and patch kit. My bike routes involve all sorts of potentially hazardous areas for tires from roads with no shoulder to uneven roads to busy roads with big shoulders that are littered with everything imaginable. 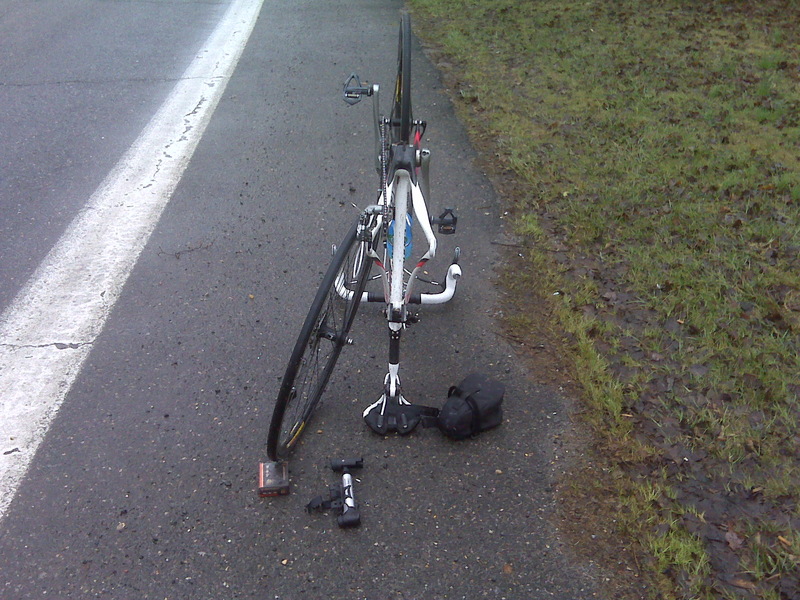 In my first season of riding, after every ride I felt lucky to come home without a flat tire. But luck cannot last forever.When I started riding this season I decided to bring my cell phone along just in case something happened that I couldn’t handle. Lo and behold, the day finally came. I had set out for a 26 mile ride on a cloudy day where I knew the roads would be messy from the previous day’s rain. I dodged debris and puddles and forty minutes into my ride thought my back tire sounded awfully odd. I changed gears and when the sound remained the same I rode a hair further to where the shoulder widened and thought it prudent to hop off and see if I had a flat. Yep. My back tire (of course it was the back tire!) had no air in it. I took a deep breath and thought “ok, I can do this.” I flipped my bike upside down, unscrewed the tire rod and with one hand pressed the chain off the gear like I had seen Tim do before and yanked the tire out of the brakes. This actually took several tries and I was worried I would pinch my fingers in between the chain and the gear. I finally got the tire off and unloaded all my tools from my saddlebag. In front of me I had two tubes, two patch kits, a pump, and no tire lever. Crap. How did I not have that tool? I was quite confident I would not be able to get the tire off the wheel without a lever so I called Tim for back-up. 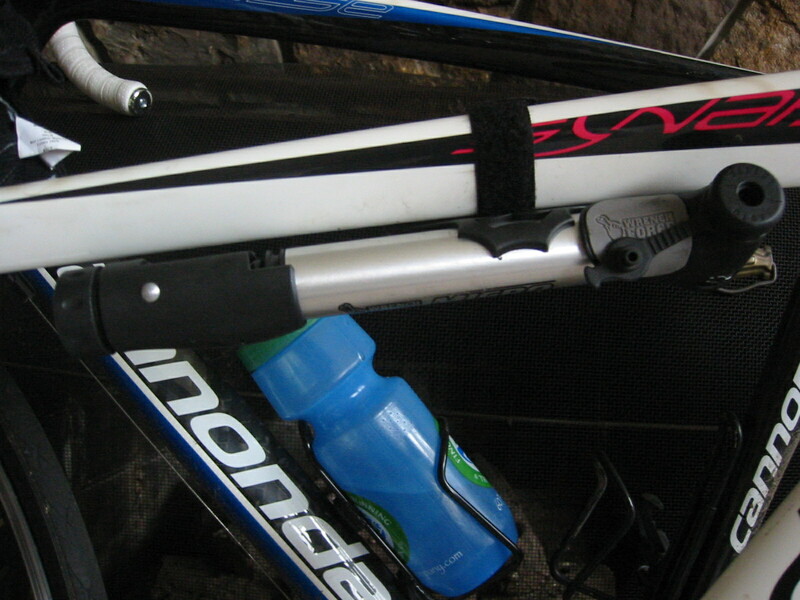 The small pump I keep strapped to my bike was sufficient for pumping the tire on the road. While waiting for my husband, a good Samaritan (who also happened to be a road biker with a full tool kit in his truck) pulled over and very kindly offered assistance. Robert, as his named turned out to be, produced an amazing multi-tool that had my tire off in seconds and by the time Tim arrived we had the whole thing put back together and inflated. (We actually had to go through the process twice because the stem bent the first time but in an effort to keep this post shorter I will leave out those details). After about a 45-minute intermission from my ride I was back on the road to finish the ride ever grateful for the assistance of Robert and Tim but also knew that a trip to the Bike Doctor was in my immediate future so I could have the proper tire changing tools, and new tubes. I also knew that I needed to be able to change my own tire. 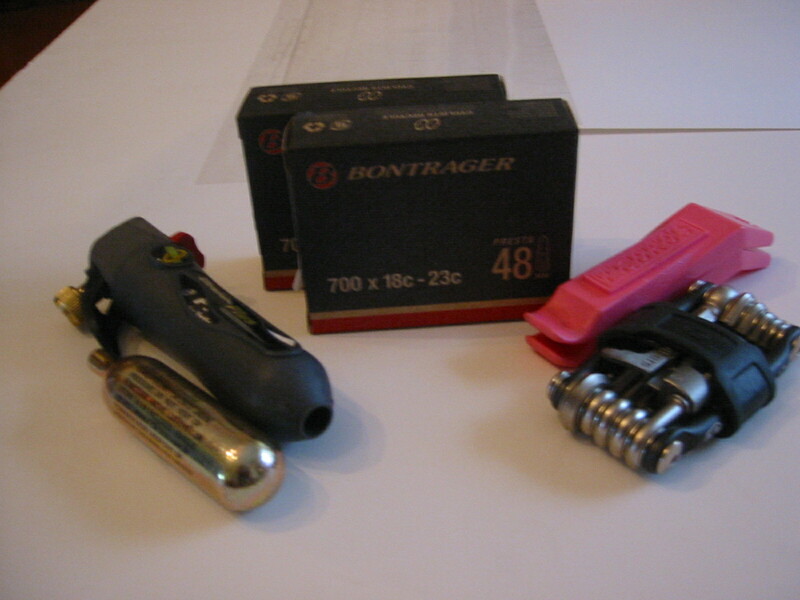 A CO2 pump, spare tubes, tire levers, and multi-tool are now in my saddlebag. Now that I’ve had my first flat tire I am sure more will follow. It’s probably in my best interest to practice changing my tires more often in the hopes that I will be more efficient in the process should I need to change a tire during a race. Counting on luck is no longer the best strategy. This entry was posted in Articles, Triathlon and tagged biking, Cannondale, flat tire, road bike, tire changing on March 19, 2010 by Natalie. Ohhh noooo! I am dreading this day. I worry about it ALL the time. Our TNT coaches have talked about giving us a lesson on this and yesterday at our team ride my husband brought it up again. Hopefully they’ll be teaching us soon. Glad everything turned out ok and thank you for sharing your notes on how to do it! Samantha, definitely practice it! You can google any variation of ‘how to change a flat bike tire’ and will find helpful step-by-step articles and posts. It’s definitely inevitable that one day you will get a flat and it’s much less scary if you’ve tried to change it yourself before. And in case all else fails, ride with your cell phone! I get flats all the time but I just change or patch the inner and move on lol! So I was out on a ride last night when I got a flat about 12 miles from home. I have put about 600 miles on the bike since I bought it in June, so perhaps it is to be expected that I would eventually have a flat. Well I keep meaning to take a bike maintenance class but haven’t yet so I really had no clue as to how to actually change the tire. Prior to June the last time I did serious biking was in college. And course it was the hard one… the rear tire… I managed to get the tire off and then figured out how to use the tool in my kit to get the rim off to get to the inner tube. I found the leak and read the instructions on the patch kit to get the tube re-sealed. I then spent considerable time trying to get the tube back inside the tire and get the tire back on the rims without pinching the tube. Eventually I did this and pumped the tire back up to 80 PSI (it is a high pressure tire). At this point someone stopped and asked if I needed help and I was feeling pretty confident so I said no thanks. I started to try to get my tire back on the rear axle through the chain and properly settled into the right place. Half an hour later I was still wrestling with the thing and I (and my bike) was covered in grease. I just could not understand why this was being so difficult to get back on when it was so easy to take off. A paceline of 20 cyclists blew by on the opposite side and for some reason not a one of them saw my waves for assistance. I was actually slightly relieved since I was acutely embarrassed that I could not put the back tire back on. The thought of 20 guys staring at me while I explained this was really too much to bear. So an hour later it is starting to get dark and my wife calls and wants to come get me and I say… “no way” because I was determined to figure it out. Finally I use my iPhone to lookup detailed instructions on how to do this and of course learn it really is trivial once you set the index shifters to lowest gear on both front and back. In fact I took it off and put it back on 5 times just to assure myself that I could do this the next time it happened…… which was 10 minutes later when I ran over a broken bottle I could not avoid. Sigh. By the time I got home the kids were in bed, I was covered in grease (including my new jersey I got on my 50 mile Saturday event, my water bottle, my headphones, my gloves and pretty much the entire bike.) My wife didn’t understand why I seemed so cheerful and it was hard to explain that I had a sense of deep satisfaction in doing the repair myself and getting home on my own. I think I had always been a little nervous about a breakdown and now I am not. I am going to grab some of those disposable latex gloves and keep them with my repair kit for next time.